King Edward I of England was resolved to impose his dominance in the British Isles. He followed in the footsteps of his father King Henry III in trying to subdue and even annex Wales. In a series of campaigns which occurred in 1277 and 1282/83 Edward notably reduced the lands of the Principality of Wales and then finally overran the entire territory. Most of these lands were maintained as a royal fief and eventually became by custom the endowment of the heir to the English throne who became known as the Prince of Wales. It was the end of independence for the people of Wales as they knew it. Edward then turned his sights on Scotland. A providential opportunity presented itself in 1287 when Alexander III, King of Scots died in a mysterious late night fall from his horse on the beach near Pettycur. He left as his heir a young granddaughter named Margaret, daughter of Erik II, King of Norway. After negotiations were concluded, Margaret was recognized as Queen of Scots and plans were made for her voyage to Scotland. In a very sad turn of events, she died on the journey leaving several claimants to the throne. The Guardians of Scotland realized they had a complicated situation on their hands and requested King Edward I adjudicate a solution. Edward was internationally respected as well as an expert in legal matters. Edward used his position as judge to claim overlordship of Scotland and named John Balliol as king. He then began making extreme demands of the Scottish people such as high taxes and soldiers to fight his wars. The Scots responded by concluding the “Auld Alliance” with France in 1295. Edward was incensed and began waging war against the Scottish people. In 1296, he attacked the city of Berwick, and pushed further in to Scotland where he defeated the Scottish troops in battle at Dunbar. Edward was now in control of Scotland and demanded the treasure and symbols of the nation, in particular the crown jewels and the Stone of Destiny or Stone of Scone which he had sent to England. The Stone of Destiny had performed a crucial role in the inauguration of Scottish kings for centuries. Edward’s seizure of the Stone was a clear signal to the Scots that they had been defeated and from now on Edward and his descendants would rule over them. Edward hired his goldsmith Adam to make a bronze chair as a kind of trophy case to hold the Stone. Money was spent but eventually Edward abandoned the idea of a bronze chair for a less expensive chair. In 1297, the king’s painter Walter of Durham was commissioned to build a painted and gilded wooden chair with glass decoration and shields around the grille on the base. Two leopards which had been made by the goldsmith were used as arms on the wooden chair. The chair was finished and placed near the Shrine of St. Edward the Confessor in Westminster Abbey. A twentieth century examination of the Chair revealed it may have been decorated in two different phases. The original Chair had a simple scheme, consisting of an overall coat of lead white paint with colored designs and vermillion lettering on the posts and pinnacles. The second set of ornamentations was more complex and included all-encompassing gilding with colored glass and painted enamels covered with clear glass. The gilding included trellises of oak and vine, leaves with birds, a grotesque, a knight on horseback and a green man. Some of this decoration is still visible. On the back of the Chair was painted the image of a king in robes with his feet resting on a lion. This was most likely a depiction King Edward the Confessor. The exterior of the back of the Chair was also highly decorated with eight standing kings. There is no evidence Edward had the Chair built to hold the Stone for coronations. The first recorded evidence of a king using the Chair for this purpose was for King Henry IV in 1399 but there is some circumstantial evidence it was used before then. A contemporary depiction of King Edward II in a chair that resembles the Coronation Chair exists. And the earliest contemporary portrait of a king, that of Richard II, currently hanging in Westminster Abbey, has him seated in the Chair although the official record of coronations does not mention he was crowned in it. Francis Sandford’s illustrated history of the Coronation of King James II, published in 1687, has the first accurate portrayal of the Chair. It appears with four lions around the base of the Chair. These may have been added for the coronation of King Henry VIII in 1509. The Chair was beginning to show serious indications of dilapidation by 1727. Initials were being carved on it by Westminster schoolboys. The shields which surrounded the grille on the base had been reduced from ten to four and a half. For the coronation of King George II, the Chair had major renovations. Four new lions were substituted, the ones we see today. Rods were added for reinforcement in the base. The Chair had another round of repairs before the coronation of King George IV. The lions and base were regilded and the pinnacles were sawed off and replaced. The base was reinforced with iron rods to hold the Stone. The following year, the original pinnacles were nailed back on. The last of the shields from the grille disappeared along with all of the glass decorations. Even worse dilapidation occurred when vergers charged a small fee to allow visitors to sit on the chair and more schoolboy name carvings were added. During the reign of Queen Victoria, the chair was “improved” by adding a coat of brown paint and other glazed areas were covered in black paint. The House of Commons were alarmed by the drastic change in the appearance of the Chair and challenged the Commissioner of Works over it. It was determined to the varnish and paint would be removed but this caused further damage to the Chair and some of the paint remained stuck to the woodwork. In 1914, when the suffragists were at the height of their political demonstrations for votes for women, someone hung a bag with a small bomb in it on the right pinnacle. The bomb was made of two bicycle bells encased in nuts and bolts. The bomb exploded, causing the pinnacle to be ripped off and deep gashes in the Chair. During World War II, the canon of Westminster and chaplain to King George VI, Frank Russell Barry had the Chair removed from the Abbey to the crypt of Gloucester Cathedral, keeping it safe from damage. In 2010, the Chair was removed from its plinth and systematic and in-depth restoration work was begun. The loose gilding was chipped off and varnish and wax removed. The Victorian brown paint was taken off revealing more of the original gilding. The integrity of the Chair was tested to be sure it could hold the Stone of Destiny again if necessary. The Chair now sits in the Nave by the Great West Door behind a glass enclosure where all visitors can see it. All the Kings and Queens from Henry IV until Queen Elizabeth II have been crowned in King Edward’s Chair with a few exceptions. King Edward V, the young son of King Edward IV who disappeared in the Tower of London in 1483, was deposed before the date set for his coronation on July 6, 1483. Lady Jane Grey was proclaimed Queen on July 10, 1553 but her support collapsed after nine days and Mary Tudor, daughter of King Henry VIII was declared Queen Mary I. Mary I sat in the Chair for the homage but was actually crowned in a different chair on October 1, 1553. Mary II became joint sovereign with her husband William of Orange after the abdication of her father King James II in the Glorious Revolution of 1688. Because there were two monarchs to be crowned, a duplicate chair was made for their coronation on April 11, 1689. King Edward VIII abdicated the throne on December 10, 1936 in favor of his brother to marry the woman he loved, Wallace Simpson before the date set for his coronation on May 12, 1937. When Oliver Cromwell established the Protectorate after the execution of King Charles I, he represented himself not as a king but more like the governor of Massachusetts. There was a great debate about kingship in 1657 and a gradual drift towards monarchical style until there was a second investiture of Cromwell as lord protector which took on aspects of a crowning. 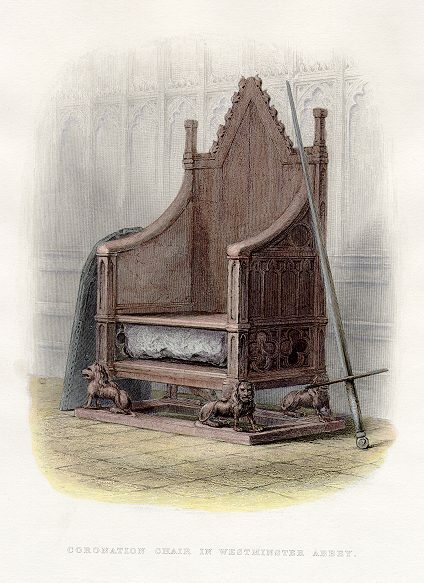 The Coronation Chair was moved to Westminster Hall where he sat wearing purple robes lined with ermine and received a sword of justice and scepter but not a sword or crown. The Stone of Destiny was stolen from Westminster Abbey in a daring robbery on Christmas Day, 1950. The Coronation Chair was damaged when the Stone was removed. After being missing for three months, the Stone was found and returned to the Abbey. But a discussion was begun about returning the Stone to Scotland permanently. It wasn’t until 1996 that the Stone of Destiny was finally restored to Scotland and it now resides in Edinburgh Castle along with the other Crown Jewels. Edward was not invited to arbitrate, he was asked to administer the findings of the court; the jurors made the decision. I was at Westminster Abbey yesterday, looking at the Coronation Chair! Isn’t it fascinating Jane? I saw it last October. I saw the chair in Westminster (without the stone) and the Stone of destiny in Edinburgh castle, that was amazing to see! Read the book the Stone of Destiny about a few Scottish students who “stole” the stone om Christmas Eve in 1951, amazing book! Wonderful read. I love this story!! Thank you so much for writing about it as it is an truly unique part of history. You’re welcome Margje. I just saw the Chair and Stone in October! As usual Susan another fascinating piece of history. Thank you.